TORONTO—The head of Canada’s intelligence agency says foreign interference and espionage are the biggest threats to Canada’s national interest, indicating businesses, academic institutions, and the technology sector, such as Canada’s emerging 5G technology network, are potential targets of state-sponsored espionage. 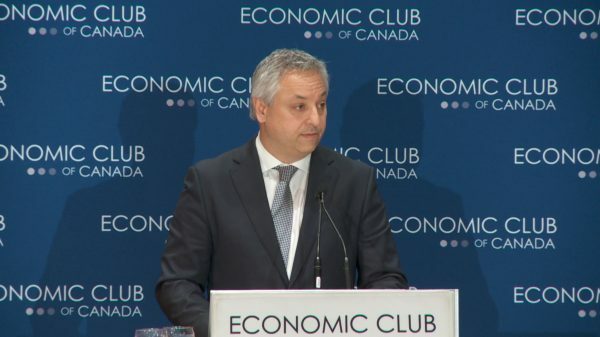 Speaking to the Economic Club of Canada, David Vigneault, director of the Canadian Security Intelligence Service (CSIS), warned that hostile foreign intelligence services or people are gathering political, economic, commercial, and military information in Canada. “Plainly said: There is state-sponsored espionage in Canada,” Vigneault said. He didn’t name any specific countries or companies behind espionage efforts against Canada’s interests. The involvement of Chinese telecom giant Huawei in Canada’ 5G technology, the next generation in wireless technology, has been a source of concern for those in the intelligence circles and reportedly Canada’s allies including the United States due to Huawei’s ties to the Chinese regime. Three of the five members of the intelligence alliance Five Eyes, the United States, Australia, and New Zealand, have banned Huawei from their 5G networks, leaving only Canada and the UK without a ban. UK’s BT Group said on Dec. 5 it is removing Huawei from the core of its existing 3G and 4G mobile operations, and will not use Huawei for its 5G network. The chief of UK’s foreign intelligence services has recently said the country needs to review its 5G network reliance on Chinese technology, Reuters reported. According to Vigneault, CSIS has seen a trend of state-sponsored espionage in fields that are active in emerging technologies that include 5G, artificial intelligence, biopharmaceuticals, quantum technology, and clean technology. “Many of these advanced technologies are dual-use in nature in that they could advance a country’s economic, security, or military interests,” Vigneault said. In late October, it was revealed that China Telecom, a state-owned Chinese telecom firm, has been diverting internet traffic in Canada and the United States to China. Earlier that month, Bloomberg reported that Chinese spies had placed computer chips inside equipment used by many private companies and U.S. government agencies, providing a backdoor to access internal networks. Canadian officials arrested Huawei’s chief financial officer Wanzhou Meng this week at the request of U.S. authorities on suspicion she violated Iran trade sanctions, the Globe and Mail reported. She is facing extradition to the United States. Large companies typically hold the most valuable information for cyber attackers. However, they also pay the most attention to and have the resources for security, Vigneault says. On the other hand, universities and small start-ups are also attractive targets. They are often looking for investors or partners and don’t always have the resources to defend themselves from threats. A report from the Globe and Mail revealed that Huawei has committed about $50 million to leading Canadian universities to help develop 5G technology. Huawei, the largest maker of telecommunications network equipment in the world, invests heavily in academic partners, stating its Huawei Innovation Research Program has covered over 300 universities in more than 20 countries. As an example, Huawei’s research partnership with the University of Waterloo covers a “a wide range of R&D initiatives, including cloud computing, next generation communications, data management and data analytics” as well as 5G related projects. An article in China’s National Intelligence Law requires organizations to support, assist, and cooperate with state intelligence work according to the law. Last month, New Zealand became the latest Five Eyes member state to reject use of 5G equipment provided by China’s Huawei. In February, the heads of the CIA, FBI, NSA, as well as the Director of U.S. National Intelligence and two other intelligence agencies testified to a Senate Intelligence Committee that they would not advise Americans to use products or services from Huawei.